I'm so excited for the March of Dimes walk this month. 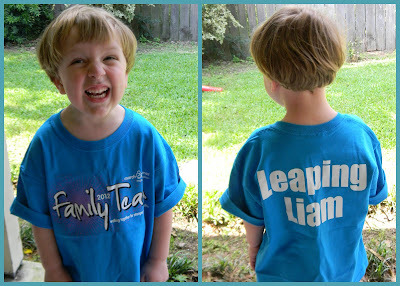 I named our team "Leaping Liam" after one of our favorite NICU nurses Pam who affectionately referred to Liam as Leaping Liam. So far our team has raised a little over $1,000! How awesome is that? I'm so thankful to the March of Dimes as they provide many research studies to help preemies and end preterm deliveries. One big thing I am so happy I received before delivering Liam over 12 weeks early was the steroid shots. Since we knew I would be delivering early my doctor suggested that I get the steroid shots. I'm positive that the steroids are what helped Liam only being on the ventilator for 8 days. I heard via the NICU nurses where I delivered Liam that the March of Dimes donated car beds during Hurricane Katrina to help transport the preemies to another facility. I was told if Liam didn't pass his car seat test that there were car beds that we could use from the March of Dimes. Car beds are super expensive since you only use them a handful of times. We still have 23 days left till our walk and there is plenty of time to donate or join our team! Any donation is accepted, even $5 is greatly appreciated. Just think of what you have spent $5 on today. If you are like me, it was probably a ridiculously over priced delish coffee (I'm currently sipping on mine now!). I'm hopeful that there will be a cure for preeclampsia found soon in order to help keep mommy's pregnant until 40 weeks and deliver big happy babies! Hopefully with the donations received from the March of Dimes a cure can be found to help other miracles like Liam.